The Final Appearance of America’s Favorite Girl Next Door is out now from the good folks at Shelf Media as an electronic book. A piece of it recently appeared in the fall 2010 edition of Arts & Letters. Now that Final Appearance is out, I’m really looking forward to getting back to work on The Bob Delusion. Second Son is now available under my own imprint, geekvoodoo books. Second Son was selected a Notable Book of 1992 and a new and noteworthy paperback of 1994 by The New York Times Book Review. It was chosen for the Discover New Writers series by Barnes & Noble. A piece of it appeared in The New Yorker. An emotional portrait of a father and son relationship–in a second novel from the author of The Outskirts (1988). 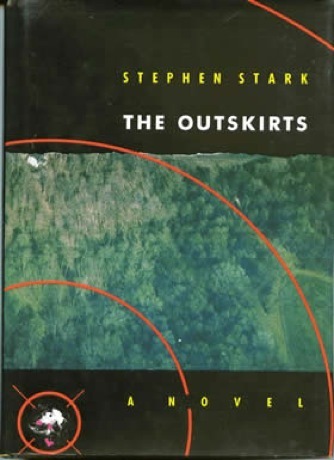 Rather like Larry Woiwode, Stark gets by on minimal plotting, instead allowing modulations in mood, and passionate exchanges between characters, to advance his story. 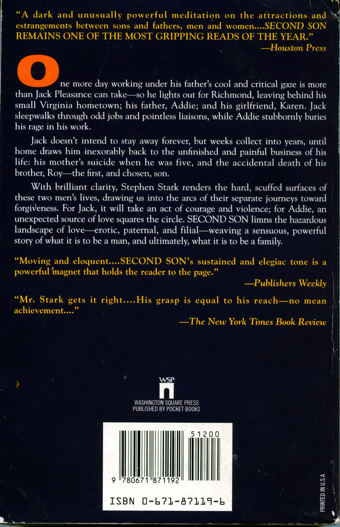 The two main characters are a father, Addie, and his“second” son, Jack. Addie’s suicidal wife and the son he loved best are suddenly, as the novel begins, dead. Though both took more than they gave, Addie is lost without them, as is young Jack. 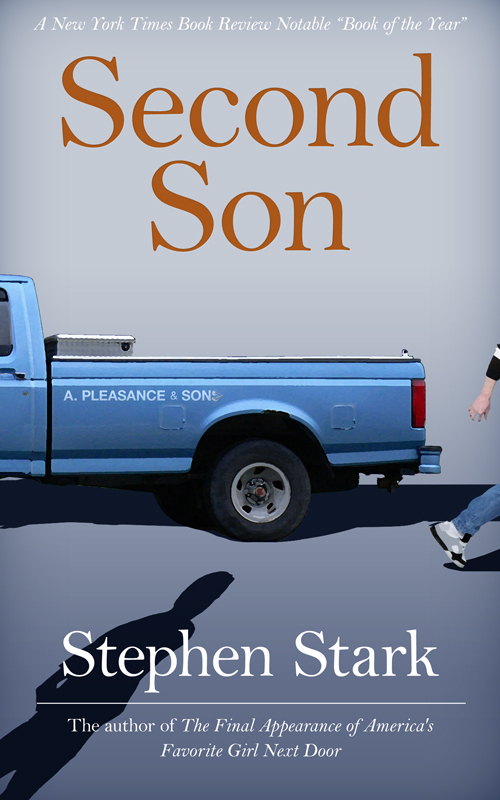 Father and son are propelled—sometimes violently—apart, as they deal with their grief and the fact that they’ve become strangers to each other. There is delight, and a kind of solace, in how well Stark knows working-class lives, in how his men talk, in how they redo a kitchen or overhaul an engine, in how they love their women. Stark’s love scenes are magnificent in their power and subtlety, and particularly in how they lunge out of control. Poor Addie goes home at night to watch every TV show having anything to do with families; to shut off the TV, in the now silent house, is sheer terror. Then young Karen, the girl Jack left behind, finds in Addie what she couldn’t in Jack. In counterpoint, young Jack comes under the spell of an older woman who begs him to hit her because she thinks all men secretly long to hit women; Jack demurs. He falls in love with a married woman, Sandy, whose husband does hit her. Love is messy, Stark is telling us, but it’s all we have, and the only way to heal ourselves. Conventional, really: father and son become reconciled, and good women heal them. What’s different here is that the men’s movement hovers in the background; Stark angrily explodes stereotypes of men as violent or unfeeling or inconstant. His women, too, come perfectly alive. Stark is passionate, lyrical, even funny. He should sell a lot of books. — Copyright ©1992, Kirkus Associates, LP. All rights reserved. This intense, moving and well-controlled first novel follows a moody, insecure high school senior, Albie Santamoravia, through three traumatic and formative months. Albie’s exceptional abilities as a runner attract the unwanted attention of a single-minded, ambitious coach, and their conflict over Albie’s desire to remain noncompetitive goes out of control when the coach urges his track team into violent acts against the recalcitrant teenager. Albie’s increasingly erratic behavior awakens the keen interest of an astute English teacher, but brings him into unpleasant confrontation with his weary but caring father. He ultimately withdraws to an isolated cabin in the woods built with the aid of Carl, a childhood friend, and Martin, a charismatic but sinister newcomer. Their sojourn in the confined quarters is not idyllic, as Albie had expected, but breeds hostility, paranoia and fear, and unleashes murderous impulses barely held in check by all three youths. Despite its glib portrayal of unrelievedly loathsome school athletes and their odious coach, this coming-of-age-novel maintains a pungent, heady atmosphere, a firm sense of place, and gives a finely tuned portrait of an ambivalent and sensitive young man bracing himself for adulthood. Copyright 1988 Reed Business Information, Inc.